July 30, 2013 - The U.S. Department of Labor's Occupational Safety and Health Administration has ordered Metropolitan Aviation LLC to reinstate a pilot after a whistle blower investigation determined the Manassas, VA. based air carrier violated the pilot's rights when he was fired. The pilot with 24 years of flight time and who is also a licensed FAA aircraft mechanic (A&P) reported that he had departed Teterboro, NJ on June 17, 2010, with four passengers in the company’s Hawker 800 aircraft. 20 minutes into the flight the pilot heard a loud bang that sounded like it came from the tail section of the aircraft, the aircraft began to vibrate, "I mean, the whole airplane shook," said the pilot and then a warning light came on which indicated the rear bay was overheating. The pilot declared an emergency with air traffic control and landed at State College airport in Pennsylvania. The pilot said “We did everything by the book. We landed that airplane safely, and everybody walked away”. The pilot contacted his employer, Metropolitan Aviation and informed them of the emergency and that he had landed at State College airport. The pilot states he was ordered to fly the aircraft back to Manassas Regional Airport for repairs by company mechanics. The pilot reported that an FAA aircraft mechanic checked the aircraft and determined the aircraft was not airworthy. The pilot refused to fly the aircraft back and within days of the emergency landing the pilot states he was fired for not flying the aircraft. However, the Company reported the pilots firing was not due to the pilot not flying the aircraft but it was due to performance issues and poor judgment. 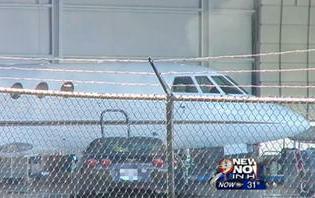 The pilot filed a complaint with the FAA and the Department of Labor (OSHA). The pilot complaint with OSHA alleged retaliation for a protected activity under the Wendell H. Ford Aviation Investment and Reform Act for the 21st Century, the aviation industry whistle blower law known as AIR21. The FAA conducted an investigation and found no wrong doing by the company. "The FAA has completed its investigation of the safety allegations contained in your complaint. This investigation has not established a violation of an order, regulation, or standard relating to air carrier safety. Therefore, the FAA is closing its investigation concerning these allegations." However, OSHA's Philadelphia Regional Office found merit to the pilot's complaint. "Pilots are protected by law when they refuse to fly an aircraft determined to be unairworthy," said MaryAnn Garrahan, OSHA's regional administrator in Philadelphia. "Air carriers that retaliate against employees for exercising their rights under AIR21 will be held accountable." As a result of OSHA's findings, the company was ordered to pay back wages in the amount of more than $140,000 for the period from June 30, 2010, through June 30, 2013. Thereafter, the company will pay at a rate of $797 per week until it has made the complainant a bona fide offer of reinstatement. The company was also ordered to pay compensatory damages in the amount of $75,000. Additionally, OSHA ordered the air carrier to take other corrective action, including expunging the complainant's termination and any reference to the exercise of his rights under AIR21 from his employment records, and the posting and providing to its employees information on their AIR21 whistle blower rights. OSHA also ordered Metropolitan Aviation to pay attorney's fees and interest on the back wages. Metropolitan Aviation began operations in November 2006, as a jet charter operator. The company is based out Manassas Regional Airport, Manassas, Virginia. Metropolitan Aviation operates heavy jets, mid cabin, light jets and turbo prop aircraft. Alan Cook is the company’s Chief Executive Officer.